Pavement signs are one of the oldest and reliable methods for outdoor advertising. The simple yet effective advertising method is guaranteed to market your brand and increase the footfall in your establishment. There’s no better way of getting your brand noticed out on the street. Perfect for running special offers, sales, promotions, launching a new product, deal or offer of the day. They can be used in a wide range of applications but are typically used outside businesses like cafes, pubs, restaurants, bars, shops, markets, garages and retail premises. Pavements signs are also ideal for use at exhibitions as a directional sign, pointing and guiding people in the right direction. Why Use a Pavement Sign? There are many advantages to using pavement signs, which is why they are such a popular display choice for outdoor marketing. 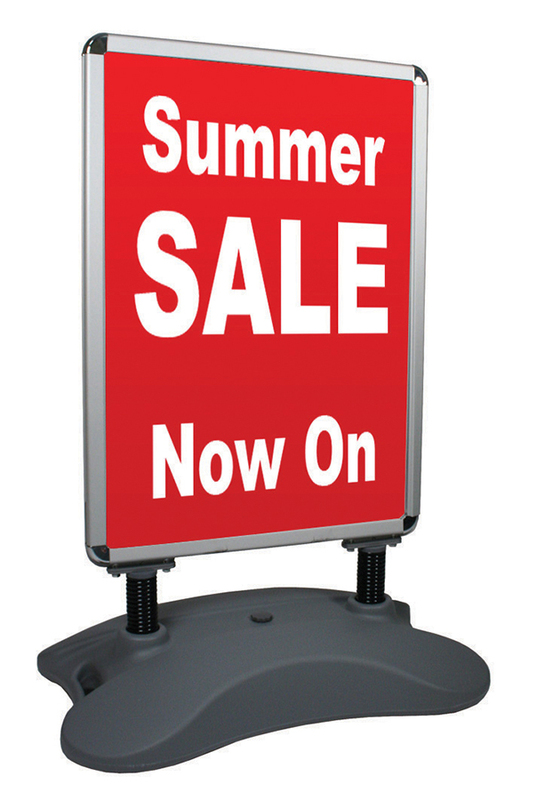 At XL Displays we offer a wide range of pavement signs with prices starting from as little as £27.00. 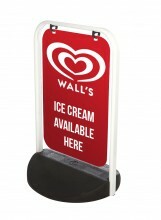 Our A-frame pavement signs are a popular choice and come in two options - silver frame or coloured frame. Available in a range of sizes, with or without post prints, they are a cost-effective solution and are one of our most popular choices. The booster pavement sign offers additional print at the top of the sign. The header is the perfect place for displaying your company logo, and the large area below provides the space for printed promotional posters. Forecourt Signs - Perfectly suited to forecourts and petrol stations, the whirlwind pavement sign offers large print areas and stability against wind. The hollow moulded plastic base can be weighed down with sand or water. The poster display is situated on top of two springs which allows it to give a little in stronger winds, providing a more flexible and adaptive outdoor sign. Directional Signs – The signboard lite and trojan signs are great for providing directional information at events and exhibitions. The lightweight design of the sign board lite makes it easy to move and from place to place, and the high-quality self-adhesive vinyl print provides a vibrant and attractive finish. The trojan directional sign can be linked to multiple trojan signs to create a guided pathway for pedestrians. The printed display area provides you with plenty of space to add event or directional information. Chalkboard Signs - Our premium wooden chalk board comes with a set of liquid chalk pens. The liquid chalk provides a stylish and professional finish which is neat and dust free, unlike traditional chalk. 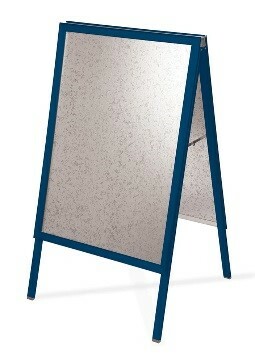 The stylish design makes this the perfect outdoor solution for cafés, bars and restaurants. Effortlessly change your daily promotion by simply wiping clean and rewriting. Swing and Flex Signs – Manufactured from a solid rubber base and powder coated aluminium frame, these pavement signs are strong and sturdy when in use. They both feature a display panel which enables edge to edge printing for maximum brand promotion. The swing sign offers the flexibility of movement and the flex sign is more static, but still allows some movement in high winds. The full colour, high-quality self-adhesive print provides your brand with a professional outdoor display perfect for marketing your message. Why Choose XL Displays for Your Pavement Sign? Quality assurance – we only sell genuine high-quality products which are backed by a reliable manufacturers guarantee. Competitive prices - we regularly review our pricing to ensure it is as competitive as it can be, without compromising on quality. We offer a price promise and will match a competitor’s price on a like-for-like product. Fast UK delivery – typically dispatched within 2-3 days to ensure your product is with you at the earliest opportunity. Award-winning customer service - we are proud of our high-quality customer service and we currently have a 9.8 rating on customer satisfaction on the independent review site Trustpilot. Be assured that we will help you through every step of your order to ensure you are happy. No artwork? Don’t worry - we offer a graphic design service and you can work with one of our designers to create a design for your pavement sign posters. For more information on our pavement signs or any of our outdoor displays contact us or call us on 01733 511030.